Ahmednagar (in modern Maharashtra) was an Islamic kingdom which existed in western India in the sixteenth century. During the late Iron Age period it had formed part of the territory of the Sattavahanas. For a long period in the first millennium AD it was ruled by the Yadavas, before falling to Muslim rulers in the north. In 1321 the rule of Delhi passed to the Tughlaq dynasty, and Mohammed Tughlaq, a descendant of that dynasty, later made Devagiri his capital. Mailk Ahmad was the son of Nizam-ul-Mulk Malik Hasan Bahri, the prime minister of Ahmednagar. At the time when Nizam-ul-Mulk Malik was murdered, his son was the governor of the Bahamani state of Junnar (near Nasik), a Deccan province between the north of the River Godavari and the River Krishna which extended as far as Purander. Malik declared independence from the Bahamani kingdom and made Junnar his capital. The Bahamani sultanate soon disintegrated and split into five independent sultanates at Berar, Bidar, Bijapur, Golconda, and Ahmednagar itself. Ahmednagar quickly captured Birar, but it too was eventually conquered, sucked into the Moghul empire and then the Maratha empire. As soon as he claims the independency of his state, the Nizamshah (or Nizam Shah, the hereditary title of the state's ruler, thanks to Malik Ahmad), founds the city of Ahmednagar on the site of the ancient city of Bhingar, transferring his capital there from Junnar. In 1499, he captures the fort of Daulatabad. Son. Ascended the throne aged 7. Courtier and regent during Burhan's minority. Son. Acceded as a minor. Murdered. Mother and regent during Murtaza's minority. The sultanate of Berar is conquered by Ahmednagar and incorporated into its territory. The sultan of Berar, Burhan Imad Shah, and his regent, Tufal Khan Dakhni, are imprisoned and both are later poisoned in that prison by Murtaza Shah. Following the regency period, Murtaza Shah annexes the neighbouring sultanate of Bidar. Unfortunately, he is murdered by his son in 1588, who then seizes the throne for a short reign of ten months. Then he is imprisoned and killed by his Persian minister, Mirza Khan. Mirza Khan in turn is killed by Jamal Khan. Jamal Khan proves to be the real power behind Isma'il's throne, until he is killed in the Battle of Rohankhed in 1591 when fighting the Moghuls and Burhan Shah, who is seeking shelter with Emperor Akbar. Ismail is deposed by Burhan Shah. Father, and brother of Murtaza Shah I. Within a few months of ascending the throne, Ibrahim is killed in battle against the sultanate of Bijapur. His successor, Ahmad Shah II, is the son of an impostor named Shah Tahir, and is appointed by Mian Manju, the minister of Ibrahim Shah. But this move is opposed by the Deccan courtiers led by Yekhlas Khan. Mian Manju invites the Moghuls to provide support to counter the Deccan lords, but sensing the great level of opposition to this move, he flees with Ahmad Shah II and the Ahmednagar noblemen invite Chand Bibi (the widow of Ali Adil Shah of Bijapur) to act as the new regent. Infant son of Ibrahim Shah. Aunt of Ibrahim Shah and regent appointed by the nobles. In 1596, the Moghul prince, Murad, attacks the sultanate with the intent of conquering and subjugating it in the name of Emperor Akbar. He is bravely repulsed by Chand Bibi. 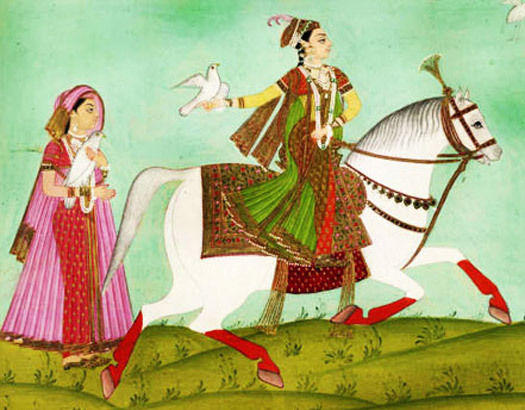 However, when she dies in 1600, Akbar succeeds to an extent in taking the Deccan plateau and the sultanates of Berar, Bijapur, Golconda, and Ahmednagar itself, along with the regions of Burhanpur and Khandesh. Bahadur Shah is imprisoned. However, the Deccan remains belligerent and fails to remain under Akbar's control for long. Malik Ambar (an Abyssinian minister) soon defies the Moghuls and declares Murtaza Shah II, a descendent of Bahadur Shah, to be the sultan in 1600 at a new capital, Paranda. Malik Ambar becomes prime minister of Ahmednagar. The capital is first shifted to Junnar and then to a new city, Khadki (later known as Aurangabad), which is constructed by Malik Amber. Aurangabad flourishes under the Moghul prince, Aurangzeb, who arrives in the area as the new governor of the Deccan. The Moghul emperor, Jahangir enforces a treaty on the Nizam Shah after staunch resistance. One of the Nizam Shah's generals is the young Shivajirao Pawar of what will one day become the minor states of Dhar and Dewas. Burhan Shah fails to adhere to the terms of the treaty, so Prince Khurram, son of the Moghul emperor, is sent to subdue the region and enforce a new treaty. This time the Nizam Shah is forced to cede a major part of Ahmednagar to the Moghuls. The Moghul governor of the recently conquered Deccan territories, Khan Jahan Lodi, agrees an alliance with the Nizam Shah, selling him the fort of Balaghat. By the time Shah Jahan sends a huge army against Lodhi, the Nizam Shah has already withdrawn his support, and Lodhi flees to the north where he is murdered after a conflict with a local king. Meanwhile, the sultanate itself is weakening due to internal dissent. In 1631 the shah's vazir, Fateh Khan, usurps the throne and places his own candidate on it, Hussain Shah. He also garners support from Golconda and Bijapur. Son of Malik Ambar, vizier, and power behind the throne. Son of Burhan Shah and puppet of Fateh Khan. The Moghuls subdue Fateh Khan, sending him and his dethroned puppet to the court in Delhi. Ahmednagar is annexed to the empire. A few nobles, including Shahaji Bhosale (father of the Maratha king, Shivaji), install an infant descendant of the first Nizam Shah on the throne, named Murtuza III, and continue their resistance against the Moghuls. Resistance figurehead under Shahaji Bhosale. Maratha noble and regent, leading the resistance. The rebels lose the war. Murtuza is handed over to the Moghuls, and the Nizamshahi is extinguished. Golconda and Bijapur also have to accept Moghul suzerainty. Shahaji Bhosale goes into the service of Mohammed Adil Shah of Bijapur.